Commissions I've bought from other artists. Gift art too. Images of Ampharos, or of Afterglow the Ampharos, my Pokésona. Commissions I've drawn for other people. Gift art too. Whoa hi there friend. My name's Afterglow. Thanks for coming to look at my cute doodles! 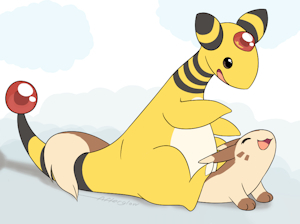 I'm a Pokémon RPer, Pokémon artist, and Nintendo fan. I also like cute critters of other natures. Basically, I am a Non-anthro furry. If you see art of mine that you like, please leave a comment telling me what about it you like. I ask because I have trouble attaching simple numbers going up (views and faves) with real people liking my art. If you also enjoy drawing cute critters or Pokémon, please get in contact with me! I'd like to be connected to more of those types. You may share my artwork wherever you like, just make sure to include a link to that art's submission webpage or to my art gallery ok? Thank you! Aww man you're stuff is very cute and nice to look at! I wanna give you a high five you do make such adorable pieces. Keep up the good work!